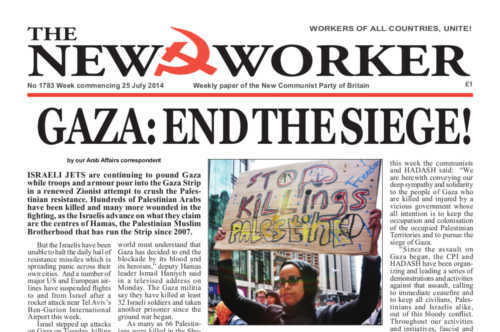 www.newworker.org | 25th July 2014 - Gaza: End the Siege! THOUSANDS of trade union and labour movement activists marched behind their banners through the small Dorset village of Tolpuddle last Sunday. They wore, with pride, their campaigning T-shirts. Two of the most popular T-shirts this year were both from the RMT, one with a picture of Bob Crow and the slogan: “Don’t mourn — organise” and another with a picture of a snake and the slogan “If provoked — will strike”. There were numerous speeches from amongst others Frances O’Grady -- TUC general secretary, Unite EC rural officer Ivan Monckton, South West Labour MEP Clare Moody, TUC president Mohammad Taj and Hugh Lanning, chair of national Palestine Solidarity Campaign (PSC). THE TRAGEDY of Malayan Airlines Flight 17 is awaiting a full investigation, which must take time if it is to produce credible answers. Nevertheless it instantly gave rise to a thousand- and-one conspiracy theories, rumours and accusations. Most of the western media instantly blamed Russian President Putin for being the sinister hand behind the tragedy — even though it happened over Ukrainian territory and is based on the false illusion that Russia has some secret control over the anti-fascist separatists. Donetsk and Lugansk, although they are Russian-speaking regions, were nevertheless content to be Ukrainian citizens — and Russia was happy to respect this — until their elected government was overthrown by western backed Nazi thugs with an agenda to drag Ukraine into Nato and the EU and to asset-strip the place and impose a more draconian austerity reduction in living standards on the Ukrainian people than they did to Greece.